Start reading How to Be Alone: If You Want To, and Even If You Don't on your Kindle in under a minute. I met Lane once a few months ago at a party during a time in my life when I was desperate to overcome my social anxiety so I could make new friends. After awkwardly inserting myself into a conversation about The Office, she mentioned writing a chapter about Jim Halpert in her upcoming book, “How to Be Alone”, and I knew I had to read it because boy did I need that instruction in my life. As a person who gets attached too easily, who too desperately wants to be liked and loved and have someone whom to give the overwhelming amounts of love in my heart, I fully expected this book to teach me how to not be miserable about not having friends and being painfully single or at least not to be so desperate for love. Instead what I got was quite the opposite of the title of the book, a sense I was not alone. Lane is at times painfully honest about how alone she has been and felt, but there is no bitterness. You see how great her capacity to love is, and you truly feel that love, as if she‘s left a piece of her heart on the page, just for you. It seems so rare these days to find people who are not shy about expressing how terribly alone they have felt, but also how deeply they care and love and all the things they want for themselves and so very much need. Many of the pages are now earmarked because I found so much of myself in this book and I want to go back and read those pages to remind myself I’m not alone in the things I feel, but more importantly that it’s ok to feel them. There are so many more amazing things to be said about this book, and I know others will find themselves in these pages just like I did. If you’ve ever experienced a time in your life when you’ve felt truly alone, this book is for you. This is like sandpaper for your heart where it needed to be smoothed out so badly because you keep getting splinters from the rough bits but god the sanding hurts too. I’m not sure I can put how I feel about this book into words, but I’ll try. 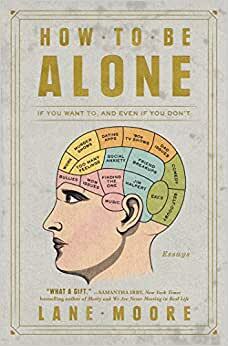 The word “alone’ has always summarized my life, and yet Lane has brought depth and meaning to my state of alone-ness I did not know I was seeking. I, too, was that kid who did everything to escape, to go outside, with friends, with a boyfriend, alone down by the creek, driving the back roads of my county once I had my license – which was the very day I turned sixteen – anything to be away from my house and revolving door of my mother and her endless parade boyfriends and relationships. Superficially, my (divorced) parents appeared congenial and cooperative to onlookers, and thus, I imagine others believed I was treated well. My (forced) independence at ages as young as six when I was a latch-key kid was celebrated as a commendable achievement. This so-called independence was a crutch enabling my parents to avoid all nurturing and care setting me up for a lifetime of abandonment and trust issues because no one was ever there for me. Tears of empathy and solidarity welled in my eyes as I read Emergency Contact Left Blank because I knew I found a kindred soul. I, too, am the kind of orphan that makes sense to no one, and Lane’s writing has made me feel seen in ways over twenty-years of therapy sessions have not. She has made me laugh at my condition and bridged a path toward acceptance that there will never be a resolution for my childhood. This book is the Reality Bites of 2018, and the companion that gets me. When I preordered this book, I felt like it was coming at just the right time in my life. Having now inhaled it in one sitting, I don't think there could have ever been a wrong time. Moore can't help but imbibe every page with humor, regardless of the subject matter, and even when I was reading through tears (which I did no less than six times, folks!) I was laughing out loud. I've struggled since high school with how to navigate romantic relationships. I wrote a paper in my junior year about my resistance to pressure to lower my standards and ‘settle’, and over a decade later not much has changed. That apparent self-confidence is completely at odds with my debilitating fear of ending up never making that connection I'm holding out for--a fear that looms larger as every day brings me closer to turning 30. This book was one of the first pieces of pop culture I've encountered that validated that unsustainable dichotomy, instead of spending untold time and energy trying to ‘see what's out there’. That happiness I'm looking for cannot be forced. This is true not just for romantic relationships but for family and friends as well, and Moore doesn't seem to hold anything back when she includes visceral personal anecdotes to propel this book beyond a mere memoir or self-help book and towards something that is far greater than the sum of its parts. I would tell you all the ways, big and small, I felt like this book resonated with me so personally and so specifically, but I get the feeling that everyone will find something that speaks almost scarily directly to their personal experiences here. Lane Moore has done a monumentally courageous thing with How To Be Alone, and I could not be more grateful to her for that. Lane Moore emptied her soul to describe her own survival. And somehow it's more funny than sad/horrifying. Lane's writing style puts you in her car, on a bad date, figuring out how to arrange furniture in a room with a dirt floor while rapists lurk outside... and you'll feel like she's telling you this while you're sitting on couches under blankets and cry-laughing. I want to give this to everyone so they can feel the warm assurance of Lane's voice that is a genius mix of devastating and triumphant, but mostly the latter. Is it weird to be proud of an author you've never met? That's me with this book. Bravo.